Neurogender is an umbrella term to describe when someone's gender is somehow linked to their neurotype, mental illness, or neurological conditions. There are many different neurogenders related to most, if not all, neurodivergencies. Not everyone who is neurodivergent has a neurogender, but each neurogender is exclusive to certain neurotypes. Oftentimes there are similar terms available to neurotypicals who have similar experiences and don't wish to appropriate. There are many kinds of neurogenders, some of which are only for people with certain neurotypes. This list is in alphabetical order. Affectugender flag created by Kiloueka. 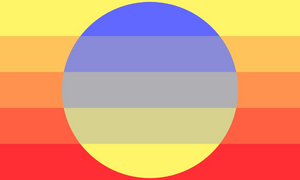 The flag design was created to represent fluctuating moods (yellow (happy/manic) to blue (sad/depressed) and yellow to red (anger). Affectugender (coined by witchtao) is defined as a gender that is affected by one’s neurodivergency especially fluctuating moods, e.g. feeling like a boy during depressive episodes and feeling more like a demigirl during happy/manic episodes. This is under the neurogender and xenogender umbrella categories of gender. 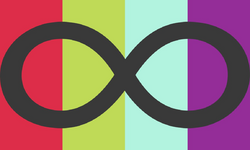 Autigender flag created by noitspronouncedgif. Autigender or Autismgender (coined by autismgender and esperancegirl) is defined as "autism as part or whole of gender identity; a gender that can only be understood in context of being autistic;" when your gender experience is influenced by or linked to your autism, or your understanding of the concept of gender itself is fundamentally altered by your autism. Bordergender flag created by npdizaya. Bordergender or Borderfluid (coined by izayaorihahaha) is defined as a fluctuating gender experienced exclusively by people with BPD. A gender identity lacking a firm grasp on ones identity, while still experiencing gender, to varying degrees, but having trouble pinning it down to just one label or identity. Having the sense of grasping at labels as much as possible to describe a gender we keep questioning because we keep second guessing our sense of selves and, consequentially, our sense of gender. Caedogender flag created by Kiloueka. The flag design was created to look like the colors representing certain genders were being "cut out" by the gray bars. Caedogender, or Caedgender is defined as a gender which has been “cut away” by a traumatic event. A gender that was once felt but has been damaged or lost due to trauma. Cavusgender flag created by Dawnrunner. Cloudgender is defined as a gender which cannot be fully realized or seen clearly due to depersonalization/derealization disorder. This is a kind of neurogender. Commogender (coined by transmomoi) is defined as a feeling that one is definitely not cisgender, but is unable to define what their gender is due to mental exhaustion. May be used as commoboy/commogirl if the person identifies with a binary gender for convenience. Commogirl flag created by pride-flags-for-us. Corugender or Flashgender (coined by gmaora) is defined as a gender identity that changes during and around flashbacks. 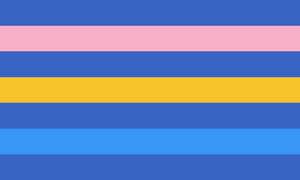 Fascigender flag created by noitspronouncedgif. Fascigender (coined by autisticjakeenglish) is defined as a gender experience largely related to an autistic special interest. Foggender flags created by Kiloueka. 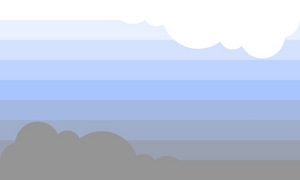 The flag design was created to resemble fog masking over the colors representing certain genders. Foggender (coined by autisticlynx) is defined as a gender which is close to a certain gender, but cannot be directly pinpointed due to brainfog (a lack of concentration or wakefulness associated with ADHD, fibromyalgia, depression, etc.) Foggender is a kind of neurogender. Genderdisordered: A gender that is heavily influenced by, or unable to be defined because of disorganized thinking or a thought disorder. Genderwhat. Being unable to understand the concept of gender or of having a gender due to neurodivergence. 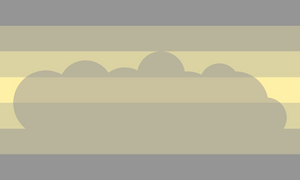 Illusogender flag created by Kiloueka and funCatty. 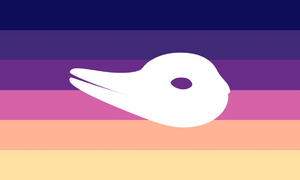 The graphic on the flag was designed to look like the famous rabbit/duck illusion. Illusogender. Coined by anonymous. When you know you’re a certain gender, but there’s still the feeling of ‘fakeness’ there, either due to neurodivergency and/or due to outside pressure from parents, society, etc. These feelings and/or pressures can be part of the gender experience. 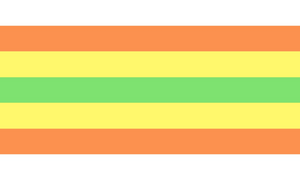 Ludogender flag created by pridearchive. 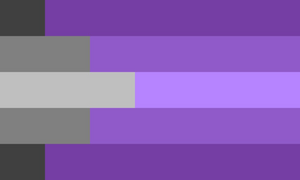 The stripe meanings are: Blue: Masculinity, Purple: Nonbinary, Pink: Femininity, White: Lack of gender , The circle in the middle represents one’s “core” gender. 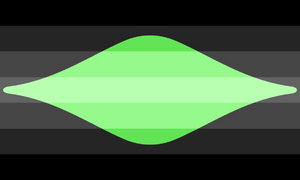 The stripes are vertical and mirrored to represent the mirroring aspect of ludogender. Ludogender (coined by anonymous) is defined as a gender which has a core, but the individual mirrors (copies) the genders of other individuals. A neurodivergent only gender. maestusgender: In which the individual’s brain chemical imbalance obscures, masks, or otherwise distorts their self perception and stunts their ability to determine gender identity. 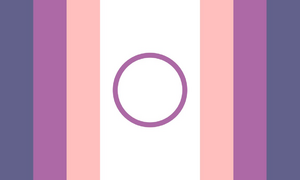 Narkissisgender flag created by Kiloueka. The flag design was created to resemble a narcissus flower aka a daffodil. narkissisgender (coined by furryhell) is defined as an egotistical gender, viewing itself in a high position and wanting and/or needing praise. should only be used by those who have narcissistic personality disorder. "Gender" can be replaced with fluid, boy, girl, xirl, boi, nonbinary, enby, nb, etc. The synonym of this word that can be used by people who don't have narcissistic personality disorder is egoisgender. 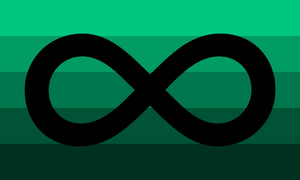 Nesciogender or Nesciōgender flag created by crypticprinxe. 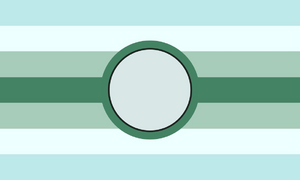 The flag design was created with mint green colors to represent neurodivergency and the circle in the center is meant to place other flags inside. nesciogender or nesciōgender (coined by princetzimisce) is defined as a gender one is not completely sure of due to one’s neurotype disallowing a clear understanding of the concept, but has a vague sense of what it could be; i.e. nescioboy, nescioagender, etc. nologender or nōlōgender: A term for neurodivergent people who have difficulty grasping the concept of gender. Distinct from nesciōgender in that the individual has no particular desire to investigate their gender, as doing so is overly difficult due to their inability to understand the concept of gender. 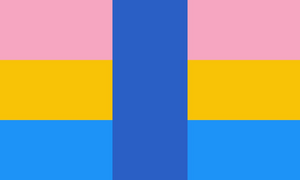 Pendogender flag created by pastelmemer. pendogender is defined as never being satisfied with your gender no matter how well it fits due to self-doubt, causing one to compulsively search and seek out something that fits even better. Gender perfectionism. For neurodivergent folks only, coined with people with anxiety disorders, OCD, and OCPD in mind. Vaguegender flags created by neurodivergentkin and strangledlove. vaguegender, or gendervague (coined by neurodivergentkin and strangledlove) is defined as a gender identity that is highly influenced by being neurodivergent, and feels undefinable or partly definable because of one’s neurodivergence. Vagueflux: A gender which is in flux, but determining the intensity of one’s gender is difficult due to neurodivergency. Vaguefluid: A gender which is fluid, but determining one’s current gender is difficult due to neurodivergency. 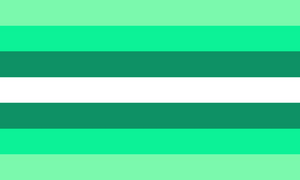 Virgender flag created by pridearchive. The meaning of the flag colors are: Red: To symbolise the stress/difficulty in having a gender, White: An amalgamation of all genders Black: Genderlessness. 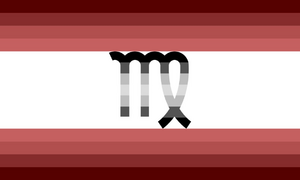 The red stripes lighten as one goes down the flag to symbolise how one’s stress is causing their gender to get weaker and weaker until it goes to white and the individual is relieved of the stress of keeping up with one’s gender. The white transitions to grey and then to black to symbolise the complete lack of gender. Virgender (coined by stevenuniversequartz) is defined as a gender identity that is practically and particularly genderless. This usually happens when it is too stressful or difficult to have a gender. A gender identity that feels weakened by stress, to the point where one is nearly genderless. The prefix comes from the constellation Virgo, the maiden. 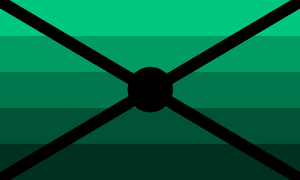 Xumgender flag created by ademcshades. 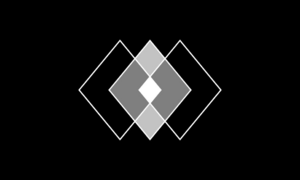 Alternate xumgender flag created by Kiloueka. Xumgender (coined by ademcshades) is defined as never being satisfied with your gender due to constant self-doubt or identity issues, causing one to compulsively search and seek out something that fits as perfect as possible–to find “the gender” or “the one truth”–though one will never be found due to one’s neurotype, because words will never be able to describe it, and/or its own properties paradox itself. This frequent anxiety and doubt even causes this gender to feel imperfect to the individual.